"Responding to the rapid growth of New York's population, the Third Avenue Railroad Company obtained its first franchise in 1852 to construct a street railway on Chatham Street, the Bowery and Third Avenue from Ann Street to the Harlem River. Operation commenced in July 1853. Despite later competition from the Third Avenue elevated railroad, constructed in 1878, the company was financially successful. From 1884 to 1886, it extended its street railway west on 125th Street and north on Amsterdam Avenue, adopting the expensive cable railway system After extensive litigation, the Third Avenue line was also converted to cable operation in 1893 and 1894. "The company began an aggressive policy of expansion from 1895 to 1898. In 1895, it obtained a franchise to extend its street railway on Broadway from 162nd Street north to the city limit at 262nd Street. In 1898, it added to its existing routes by acquiring street railway lines in Manhattan, the Bronx and southern Westchester County through the purchase of the capital stock of the Union Railway Company, the Westchester Electric Railroad Company, the Yonkers Railroad Company, and the 42nd Street, Manhattanville, and St. Nicholas Avenue Railroad Company. A final and major addition - completing the company's Bronx monopoly - was the purchase in 1912 of the New York City Interborough Railway. Swift growth of trolley, or electric railway, lines had followed the successful installation of an electric street railway by Frank. J. Sprague in Richmond, Virginia, in 1888. Sprague's system required an overhead trolley wire, but the electrification of Manhattan's streetcar routes was prevented because the city of New York steadfastly prohibited overhead wires on the streets of Manhattan. However, in 1895, the General Electric Company developed a successful alternative: the underground conduit railway system. The company then proceeded in 1899-1900 to electrify its Manhattan routes with the conduit system replacing the cable railway. "The financial consequences of corporate acquisitions, construction of cable lines, and their subsequent conversion to electricity exhausted funds and forced the Third Avenue Railroad Company into bankruptcy in January 1900. Its Manhattan competitor, the Metropolitan Street Railway, took advantage of Third Avenue's insolvency by leasing its railway property for a term of 999 years. Metropolitan's own bankruptcy in 1908 canceled the lease, and Third Avenue again became independent but also insolvent, and went back into receivership until 1911. The receiver improved the property, including the purchase of 515 new cars between 1908 and 1911. "In December 1911, the company was reorganized as the Third Avenue Railway Company. During the next 20 years, it prospered as the population in its service area increased. Service and route adjustments were made as rapid transit lines were extended in the Bronx. ... However, by 1930, Third Avenue's rolling stock was technologically and operationally obsolete, and the company was confronted with the formidable task of total equipment replacement. Political control of fares by the city of New York impaired the company's financial resources, which required that new cars be obtained with the lowest possible investment. The management resolved to cope with this problem through a unique program it devised by purchasing 61 used cars and constructing 600 lightweight steel cars of its own design. The construction of new cars commenced in 1934, and by 1939, some 336 cars had been completed in its large, well-equipped shop at East 65th Street and Third Avenue. In this period the company was the second largest streetcar builder in the country. "During the building program, F. H. LaGuardia was elected mayor of New York. He had an open hostility to streetcars and wanted them banished from city streets. ... Threatening not to renew valuable and important bus franchises in the Bronx, LaGuardia coerced the company in August 1939 to agree to replace its streetcars with motor buses. ... World War II intervened in 1941, halting the program per order of the United States Office of Defense Transportation ... and by May 1947, all Manhattan car lines were now operated by motor buses. Immediate conversion was not required in the Bronx, but new management in 1947 embarked on an accelerated replacement of streetcars in that borough as well, completing the change in August 1947. The cost of this hasty and ill-considered bus conversion program created the anticlimax of bankruptcy in June 1948." "The origins of the Third Avenue Railway System can be traced back to a simple horsecar line operated by the Third Avenue Railroad Company between City Hall and 62st [sic] Street in Manhattan in 1853. By the 1870s, routes had been extended as far north as 129th Street and across the length of 125th Street. At its peak, more than 1700 horses were stabled by the railway to keep up with demand. By 1885, Third Avenue Railway had opened its first cable car line on Amsterdam Avenue. The 125th Street and Third Avenue lines were converted to cable car operation in 1893. The lines were converted to electric operation in 1899. Because of a ban on overhead trolley wires in Manhattan, streetcars collected power from a conduit in between the rails, by means of a plow, a method also used in Washington, D. C. and London. Some cars were equipped with trolley poles for operation on lines outside Manhattan into the Bronx. In many cases the conduit was run in the former channel occupied by the propulsion cable. The Third Avenue Railroad expanded in 1898 with the acquisition of the Dry Dock, East Broadway and Battery Railroad and the Forty-Second Street, Manhattanville and St. Nicholas Railroad. Additional properties include the Belt Line Railway Corporation, the Mid-Crosstown Railway, the Brooklyn and North River Railroad (a joint operation with Brooklyn Rapid Transit, New York Railways, and TARS operating streetcars over the Manhattan Bridge), the Kingsbridge Railroad, the Westchester Electric Railroad, and the Yonkers Railroad." A MetroWiki article adds this information, "The Third Avenue Railway was a street railroad company in the U. S. state of New York. It operated lines in Manhattan, the Bronx and Westchester County, with its main line along Manhattan's Third Avenue. 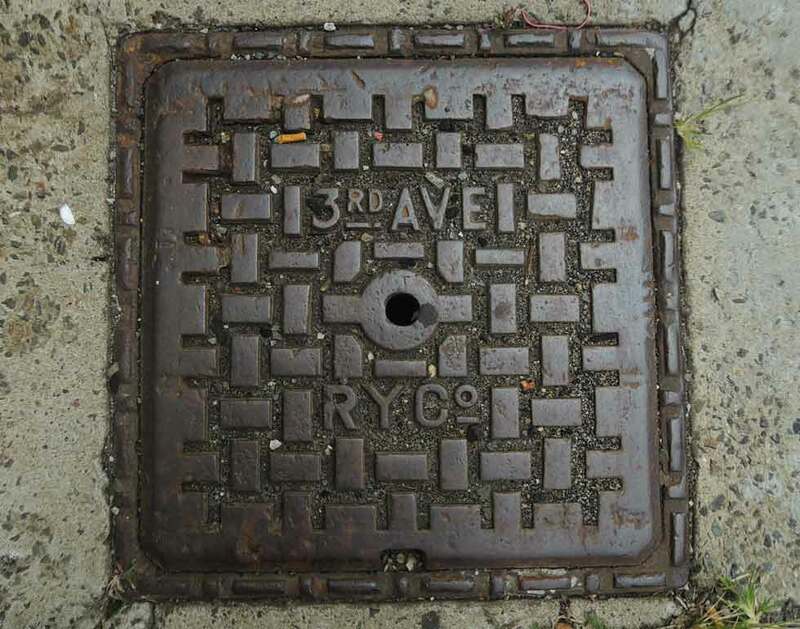 The precise name of the company was changed from Third Avenue Railroad Co. to Third Avenue Railway Co. in 1910, and then again to Third Avenue Transit Co. in 1942. The following lines existed in later days. 10 Tenth Avenue line: 42nd Street, 10th Avenue, Broadway, and 125th Street from West 42nd Street Ferry to West 130th Street Ferry. B Broadway Line: 42nd Street, Broadway, and 125th Street from East 42nd Street Ferry to West 130th Street Ferry. . . . T Third and Amsterdam Avenues Line: Park Row, Bowery, 3rd Avenue, 125th Street, and Amsterdam Avenue from City Hall to Fort George. . . . X 125th Street Crosstown Line"
This coal chute cover sits on 129th Street in front of 495 W. 129th Street, which is described as follows in the AIA Guide to New York City, fifth edition, by Norval White & Elliot Willensky, with Fran Leadon, 2010, "The Met's tin shed: The grimy shed sheathed in corrugated iron occupying some two-thirds of an acre at 495 West 129th Street, east of Amsterdam Avenue, shelters all manner of bulky sets for the Metropolitan Opera House at Lincoln Center. It was built around 1895 as a storage shed for Amsterdam Avenue streetcars."